WILMINGTON, Del. 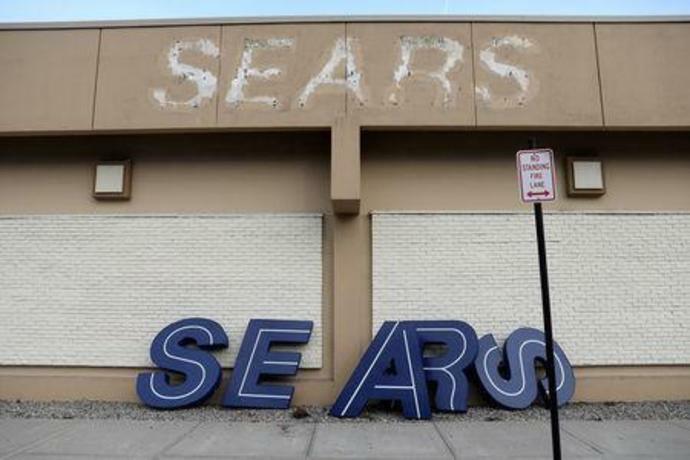 (Reuters) - Sears has survived the Great Depression and world wars. Whether the 126-year-old retailer stays afloat or goes out of business now hinges in part on paying for the enormous bill piled up by going broke. The fate of Sears Holdings Corp highlights a harsh reality of U.S. bankruptcy - it requires armies of pricey specialists in a system driven by an outcome, not costs. On Monday, Sears will consider bids for its assets, including a last-ditch $5 billion proposal by chairman and controlling shareholder Eddie Lampert. To ensure his chances of outbidding proposals to liquidate the chain, Lampert last week agreed to assume more than $600 million in additional liabilities that Sears has incurred since filing for bankruptcy protection last October. Those so-called administrative claims includes taxes, and payments to vendors and the professionals advising Sears. "The fees in a case like this will be tremendous, you've got people working round the clock," said David Wander, bankruptcy attorney at Davidoff Hutcher & Citron. "A massive case requires a massive amount of legal talent." Sears, which also owns the Kmart discount chain, is picking up the tab for six law firms, three investment banks, two financial advisers and seven others that are providing tax, real estate advice and other services, according to court filings. Although the final tally will not be known until the case ends, the fees mount quickly. The law firm of Weil, Gotshal & Manges, for example, billed Sears about $5 million for the first two weeks after it filed for Chapter 11 bankruptcy protection on Oct. 15, according to court documents. Weil did not respond to a request for comment. Sears declined to comment. Bankruptcy veterans said the fees reflect the realities of Chapter 11, which can inflate costs: only a handful of law firms can put scores of experienced staff on a case on short notice. Corporate leaders are happy to pay top dollar when the company's survival is on the line. The 2008 bankruptcy of investment bank Lehman Brothers Holdings Inc has been the costliest case by far, surpassing $2 billion, and large failures such as Enron Corp in 2001 typically run up bills of hundreds of millions of dollars. Since lawyers and other advisers generally get paid first, critics such as academics often blame their fees for reducing the amount left for creditors and employees. The rising cost of Chapter 11 also reflects increasingly complicated corporate structures, and the sometimes convoluted financial dealings that a struggling company might undertake to avoid failure. For example, Sears struck a series of refinancing deals with Lampert, which will now be investigated by a special restructuring committee of the board. The committee will get its own set of lawyers and advisers to avoid potential conflicts of interest, piling on costs. In addition, Sears will also pay for professionals for an official unsecured creditors committee, which is typical. At least 36 lawyers are billing Sears $1,000 or more an hour, according to court filings. Of course, high hourly rates could be worth it. American Airlines and General Motors arguably thrived thanks to bankruptcy, although retailers in particular tend to perish in Chapter 11. Legal experts say that comparing the cost of Chapter 11 cases is nearly impossible because of the large number of variables in each case. "I'm not sure we really know what a large chapter 11 case should cost, so its hard to 'control' fees unless they are extreme," said Stephen Lubben, a professor at Seton Hall Law School. Toys "R" Us in its first three months piled up more $45 million in fees, according to court records. The retailer, which went out of business after filing for bankruptcy in 2017, has paid 72 firms $375 million through December. Judges have ordered fee examiners to hunt for unnecessary charges in the enormous fee statements - Weil's for the first two weeks of Sears ran 330 pages, breaking down each lawyers' time into six-minute intervals. Lynn LoPucki, a professor at the UCLA School of Law, called fee examiners mere window dressing on a broken system. He said judges should require evidence from firms that they charge the same rates for clients in or out of bankruptcy. "Most lawyers would tell you bankruptcy is a highly profitable practice," he said. Should Adam Schiff step down as House Intelligence Committee Chairman? Which Big Canadian Marijuana Stock Has the Most Upside Potential Right Now?